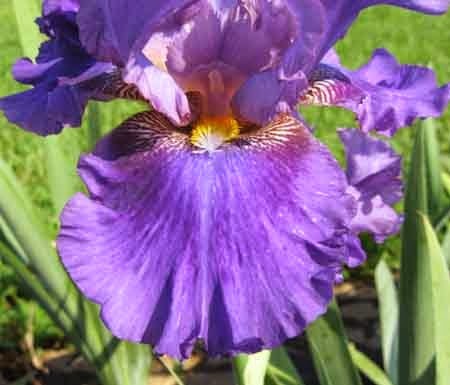 In the spring of 2016, the American Iris Society Region 15 Garden Tour will come to my area, and for the first time I volunteered to grow guest irises in hopes that they will survive my gardening skills long enough to put on at least one show of blooms for the attendees. 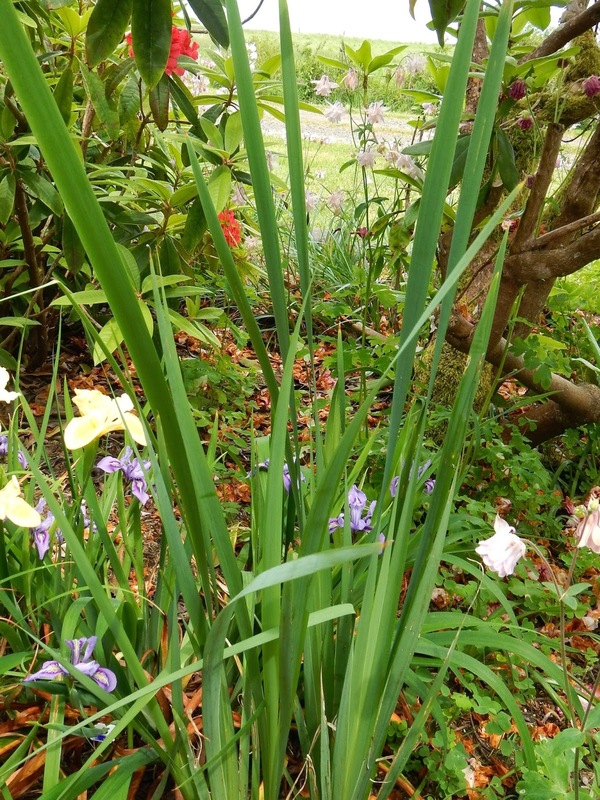 In case you are unfamiliar with these tours, each year hybridizers of new irises send dozens of rhizomes of their newest creations out across the country to live in "guest gardens" two to three years before national or regional garden tours. Volunteers grow the irises and record their performance, and iris lovers sign up, load onto buses or into car caravans, and tour all of the gardens during the treks. Iris judges take notes about the new plants and evaluate their health, vigor, and blooms. My original intent in volunteering to grow these irises was to have an excuse for expanding my garden beds at the expense of my husband's lawn. Mikey and I are like two feudal lords, jealously guarding the borders of our domains and expanding into neighboring lands when our opponent is occupied on other fronts. My latest strategy is a row of unmortared bricks lining my beds. Using a half-moon edger, I can slice out three to four inches of unprotected St. Augustine grass in under an hour, move the bricks out, and pretend like I have just "edged" the lawn for my husband. The request from the San Fernando Valley Iris Society to grow guest irises was the perfect excuse for demanding a huge island bed in the center of the lawn, where the sun is best, since the big coast redwoods shade the rest of the yard. My bid was foiled, however, when Mikey offered to fell the ailing and dehydrated coast redwoods, letting sun stream into one of my existing beds instead. This I allowed, since his other offer was to add an arbor so he could hang himself. The next challenge to growing irises in my garden is me. I want lush, green, flower-filled English gardens and I live in a drought-stricken, hot inland Southern California valley. I know, I know, I should accept the natural order of things and go native, and I have eliminated some of my favorites because they are so thirsty. Even with these changes, weekly irrigation is still a necessity, and that can cause irises to rot, especially when beds are irregularly shaped and lawn sprinkler water reaches them. I left two patches of Japanese Blood Grass, which appreciates a good swim now and then, at a lower elevation in the bed in the vain hope that water will drain through the raised irises and into the gully of blood grass. An old plowshare blocks the back spray from the worst offending Rainbird, and in this photo it appears that it will have the added benefit of knee-capping Mikey while he mows. I shall hand-water the new plants when they get dry, and avoid watering in the heat of summer, which should help prevent rot. The guest iris bed. Please ignore the yellowed St. Augustine grass and the crispy Bridal Wreath Spireas and pray for rain in Southern California. After growing in pots in the shade through the hottest part of the summer, I planted the irises in the new bed in September. The plants had healthy looking roots and seem to be adapting well to their new home. I organized them according to color and height, with the area near my red rose in front of the tuteur for the red irises, the corals, oranges, peaches and pinks next, then warm orchid and red-violets, to purples in the back, over across the blood grass to coppers, tans, yellows and whites, and finally in the far back a few blues. I stretched plastic bird-netting over the soil and cut holes for the irises to foil the excavations of squirrels, raccoons, oppossoms and Pogo the One-Eyed Cat. 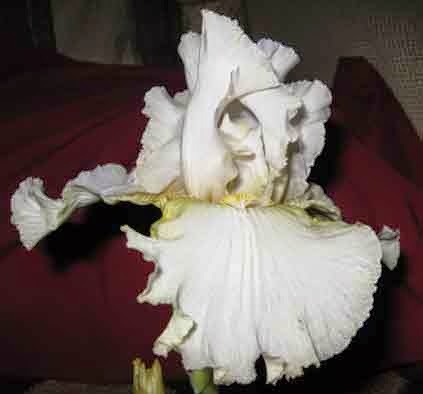 There is one Arilbred iris I am obsessing over, and one IB, since I have never grown them successfully in the past, but otherwise I have high hopes for the show in the spring. I may plant color-coordinated violas between the irises for the trek. What do you think? Bare dirt, or a few violas, violets, and gazanias for ground cover? I'll be sure to post photos of any surviving plants in bloom this Spring. And be sure to take a look at the American Iris Society website, join your local society, and plan on going on a Spring Garden Trek! 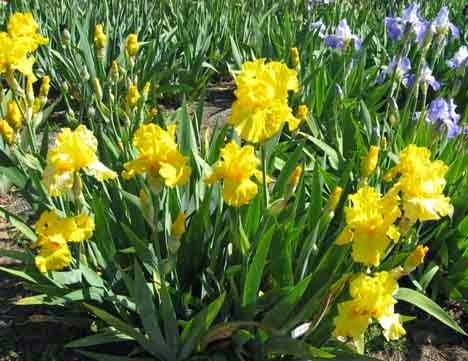 In the world of irises, there are different guidelines for garden judging and exhibition judging. What is the difference, you ask? Show bench irises for exhibition only have to look good, and be good, for one day. Garden judging involves how an iris appears in the garden, not for just one day, but for the full iris season. It also assesses plant health, branching, bud count, and sequence of bloom, among other things. Sequence of bloom not only involves how the blooms open on the stalk, one at a time, two at a time etc., but how the stalks extend from the iris clump. For instance, an iris I grew years ago had approximately 15 stalks and they all opened the terminal buds on the same day, and then it bloomed all of the first branch primary buds a couple of days later. Yes, it was beautiful, but the clump was finished blooming in just a few days. 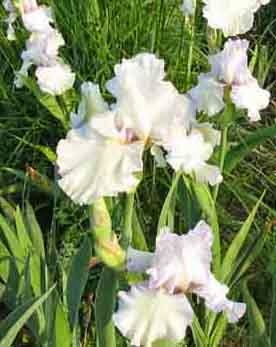 An iris that puts up one stalk at a time, like 'Summer Radaince,' displays its beauty for a much longer time. When you hear people speak of their remontant irises, they are talking about reblooming irises. Reblooming irises extend the length of bloom per season, per iris. 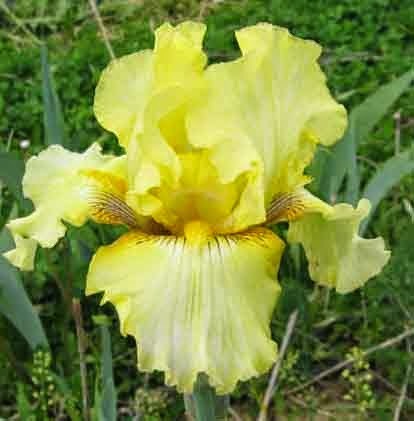 Since there are only two or three fall shows for reblooming irises in the United States of America, most of my focus is on hybridizing good garden qualities. 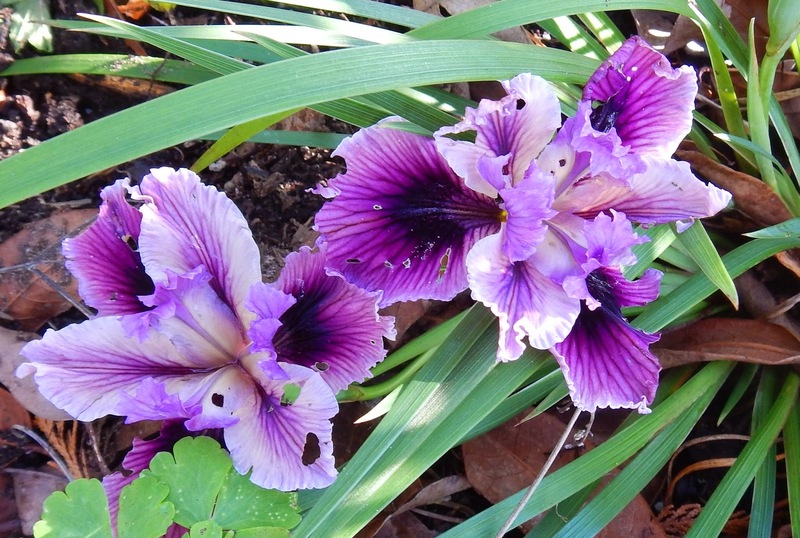 I'm particularly fond of irises that are dependable for rebloom, as are those shown on this page. My interest in rebloom began over 30 years ago, because I love iris blooms so much that spring bloom was not enough for me. I'm as thrilled with one bloom as most people are with a whole clump! When planting a new rebloom bed in my garden, I first research the cultivars that rebloom well in my area, zone 6. Second, I plant them in a good spot. Third, I make sure I water and fertilize them well. Nevertheless, there are no guarantees! We are still bargaining with Mother Nature. As a breeder, I have the added advantage of seeing seedlings, like 1907-10Re, that others may never see. Ask any questions you like. Enjoy! The seasonal forecast for the Pacific Northwest was for a mild, warm, drier-than-normal fall. Hmm. Warm, yes; dry, no. So far we've had a series of storms blow through, each one dropping around two inches of rain. 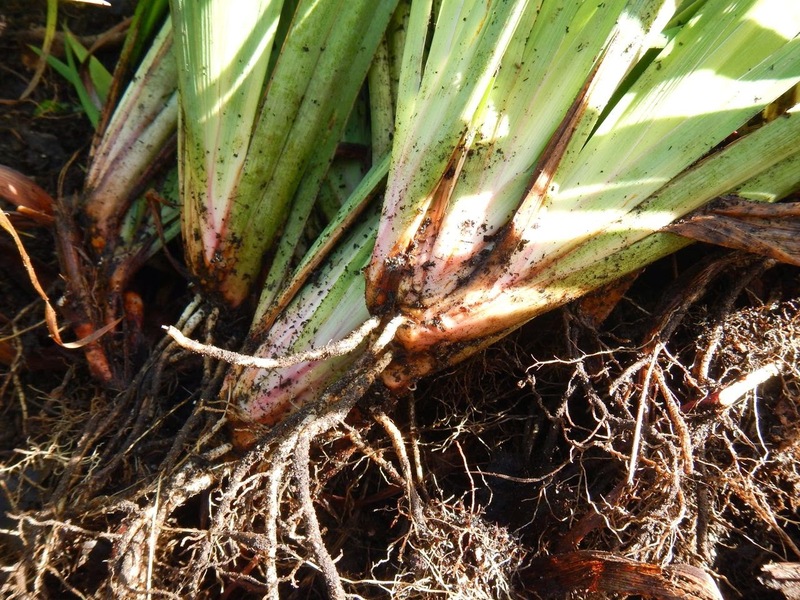 For dry gardens (those that do not get additional irrigation water), this means that Pacifica Iris began putting out new roots a few weeks ago. New white roots means that these plants can be dug up and transplanted. 'Premonition of Spring' in flower between storms; the flowers aren't perfect due to the weather and slugs, but provide a cheerful corner in the garden during winter. 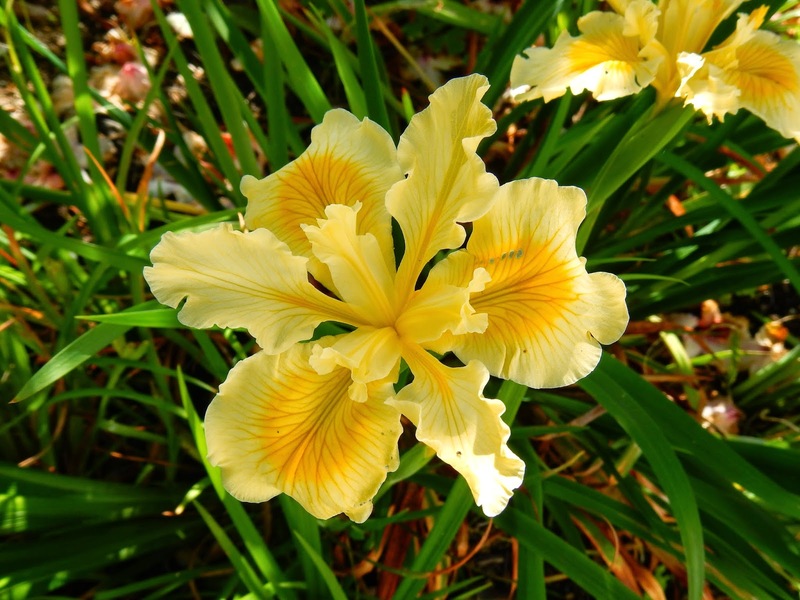 Pacifica Iris are notoriously fussy about being moved, particularly in climates with prolonged dry summers. I've mentioned before that checking the roots to make sure that there are 1-4 inch long white (live) roots is important for success. 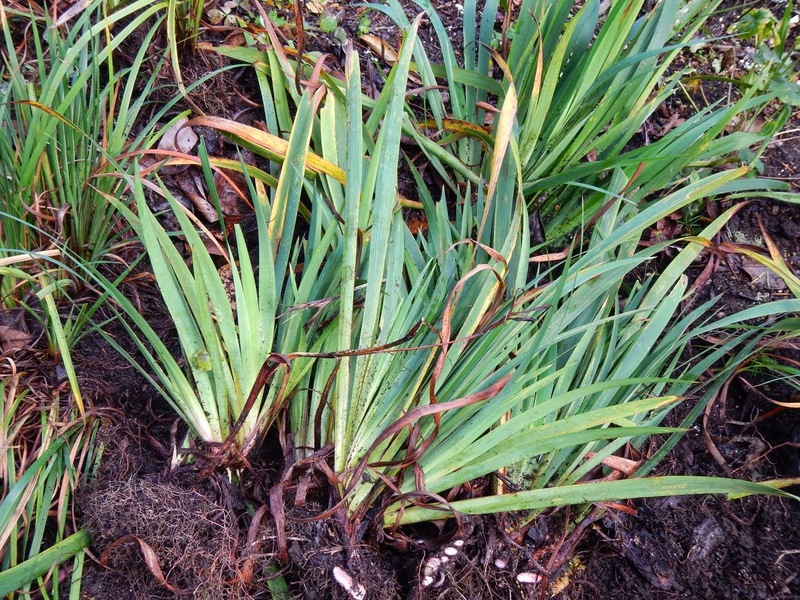 New roots on Pacifica Iris fans show that this plant is in active growth and can be moved. Today I went out between showers (the thunder, lightning and hail type of showers) to redo a densely overgrown patch of PCI seedlings. Let's not go into why I did not do this two or three years ago. As gardeners know, life often gets in the way of garden plans and ideal timing for gardening activities. 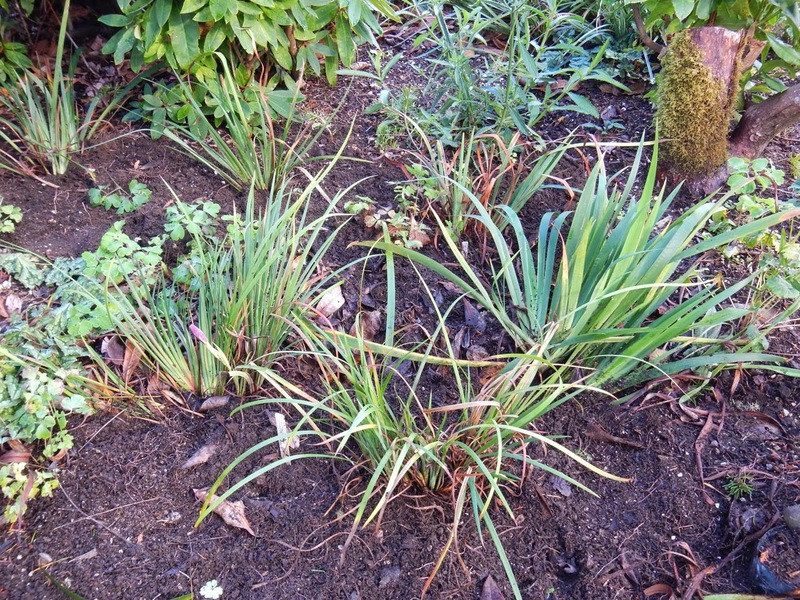 There are five different irises in this patch: four seedlings, one of which has not yet flowered, and one named variety. What a little procrastination can give you: a near-solid mass of irises to separate and divide. If I'd waited another year, it might have been near-impossible to divide out the different seedlings. 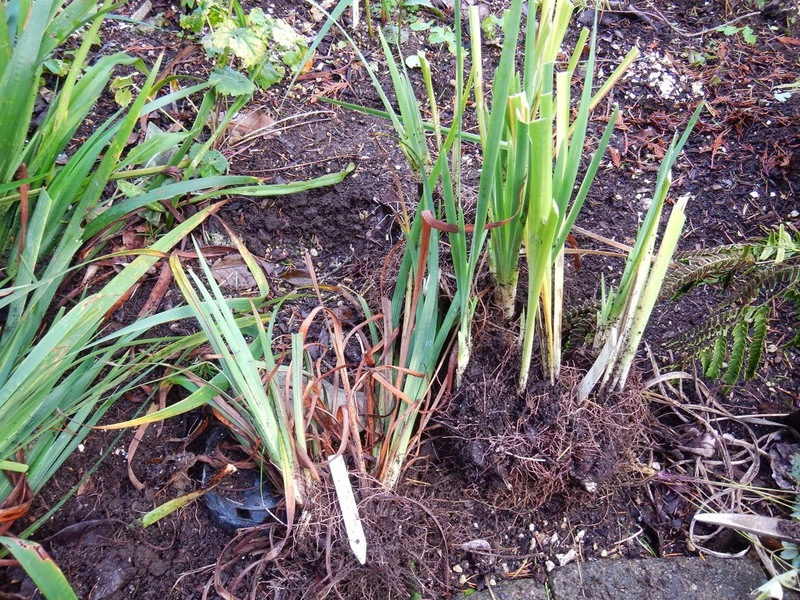 Spuria iris on the lower right (its long leaves were broken down in the last storm), 'Premonition of Spring' on the left, next to the cyclamen, and in the middle, three massively overgrown PCI seedlings. One of the seedlings is not going back into the garden. It came to me as orange-flowered I. innominata seed; by the second year it was clear that this seedling is really a Spuria Iris. So it's going south to Los Angeles, to a much warmer climate where it might actually flower. 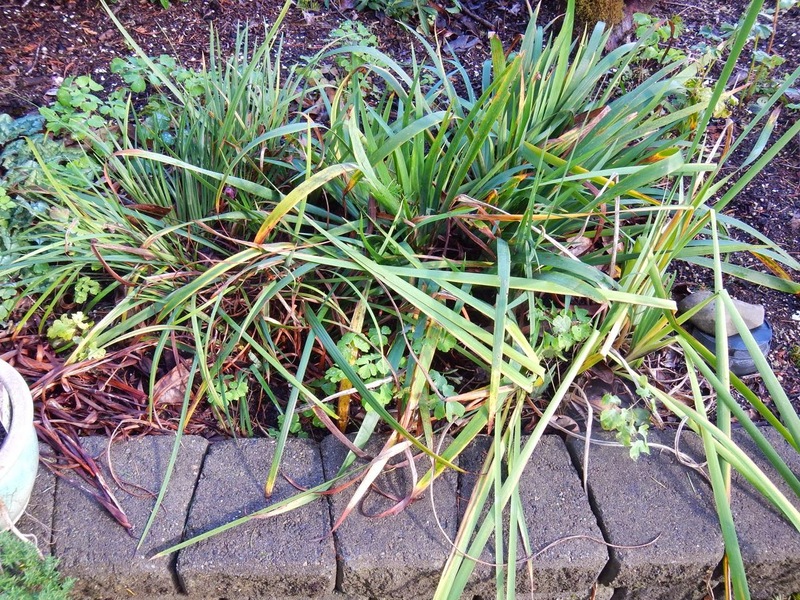 The clue that this clump is not a Pacifica Iris: the leaves were three to four times as tall as the other irises around it! Pacifica Iris clump in the middle, Spuria clumps on the right with their leaves already partially cut back. Three of the seedlings are from open pollinated seeds from Debby Cole's garden on Mercer Island, Washington; the pod parent is her vivid PCI hybrid 'Egocentric'. I'm still evaluating the lavender flowered seedlings; the yellow seedling is a nice sturdy plant, and I'm sending starts to other gardens. One of the lavender-flowered PCIs from an 'Ecocentric' pod parent seed lot. Another seedling from the same seed lot; sturdy short plant, waiting to see the flowers for one more season before I decide to keep or toss. A yellow flowered Pacifica seedling, pod parent, I. 'Egocentric', from Debby Cole. This one I will keep. The plant is sturdy, the flowers are held well above the foliage, and are well shaped. 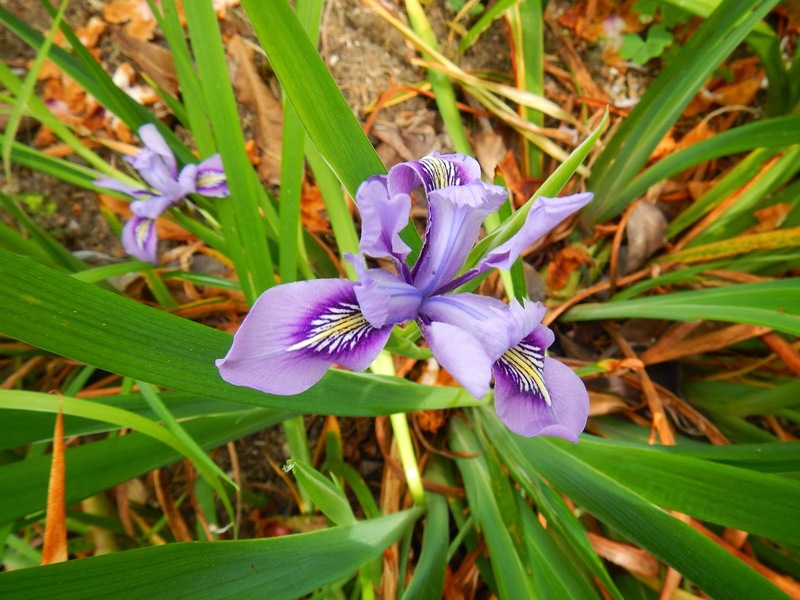 The fifth iris clump in this patch is 'Premonition of Spring', Garry Knipe's winter flowering selection. I divided this one into two smaller masses and replanted one near the other. Like Iris unguicularis, it flowers sporadically from fall through early spring. In fact, both clumps (POS and I. unguicularis) have buds or flowers right now, and will flower occasionally during fall-winter-spring months. I plan to move an I. unguicularis clump nearby. Once each clump is out of the ground, I use clippers to cut apart the fans. Sturdy rhizomes grow between groups of fans, and my hand clippers easily cut through them. A nice pile of more than one dozen fans are going to other gardens. After replanting, the plants have room. Next spring I'll be able to see the flowers on each plant more easily, evaluate them, and decide which seedlings to keep. I also found two mesh bags with seeds inside––these are going to be scattered in a patch of native grasses to naturalize. Lifted, divided, and replanted, and ready to grow on this fall and into next spring. I was done just in time to avoid the next shower! Iris cristata, the Dwarf Crested Iris, is native to much of the eastern half of the USA. It is represented in the north by its smaller cousin Iris lacustris, the Dwarf Lake Iris. I. cristata prefers good drainage and open woodlands. It is most at home in the Appalachian, Ozark, and Ouachita mountains ranges where it can be seen flowering by the thousands. Even though it wants good drainage it is often seen along stream sides and even growing in the rocky bed of a shallow rill. It quickly forms dense clumps in a garden where it is most happy on a north facing slope. It also does well on the north side of a house as long as it gets bright light. Iris cristata is usually seen in shades of blue and lavender but white flowered forms are not rare. My biggest challenge to growing this Iris is the occasional drought. While demanding good drainage it also needs a reliable supply of moisture. 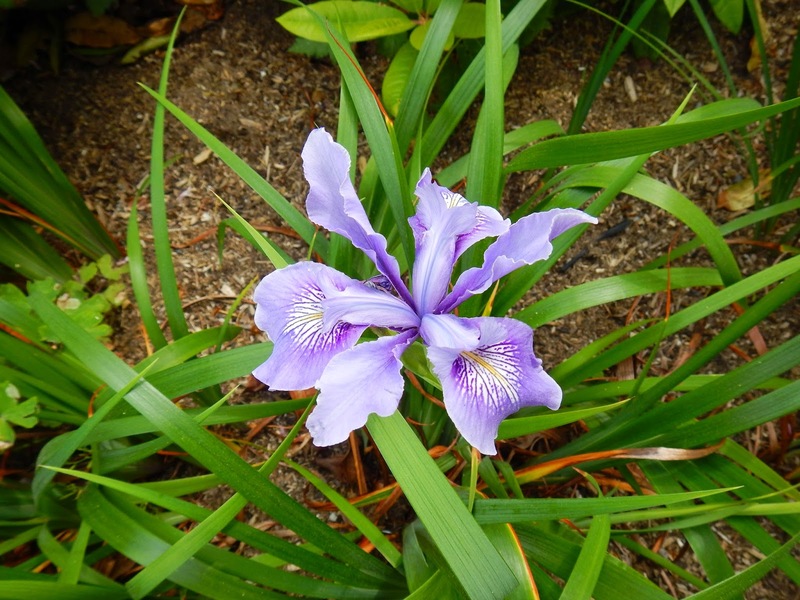 It is a tough little Iris and can survive typical summer dryness but must have supplemental water when rains fail outside of its native range. There are no known hybrids between I. cristata and other species. My friends Dan and Irene used to canoe in the Ozarks several times a year and had never seen Iris criststa. I told them it was everywhere but they could not believe that. I visited the mountain range with them one spring to see this Iris. Once I pointed it out a few times they started seeing it at every turn and were convinced. There have been rumors for many decades of pink flowered forms but none have made it into cultivation. That would be a worthwhile contribution to horticulture. Hardiness is claimed for USDA zones 3 to 9 but 5 to 8 are more likely. I'm curious who grows the Dwarf Crested Iris outside its native range. Is it easy or has it become a diva when far from home?